Possible new nova in Circinus. Discovered by John Seach, Chatsworth Island, NSW, Australia. DSLR with 50 mm f/1.2 lens. Object visible on 3 images. No object identified at position on 3 images taken with same instrument on Jan 18.7 UT. No minor planet or variable star at position. No object on DSS2-red." USNO-B1.0 0225-0595724, 2MASS J13532702-6725105, NOMAD1 0225-0600516, XPM 045-0587677. The nearest GALEX source (GALEX J135327.5-672500) is 11" away. (probably contaminated by nearby stars); 19.339, 9.00. Spectroscopy and precise astrometry are urgently required. Just I was inputting my nightly observations just at morning twilight, I saw Patrick's note and hastily printed out a chart and heading back outside. The nova suspect was easily visible (mag 8.2 at Feb 18.868UT) in a bright sky at the discovery location specified. There is a new sequence available for PNV J13532700-6725110. Andres Chapman (Argentina) reports V= 9.12 mag on 2018 Jan. 20.15848 UT (40-sec exposure) and co-ordinates RA 13h53m27.60s, DEC -67°25'00.7" (J2000.0; accuracy about 0.3"). A Gaia DR1 source (position end figures 27.59s, 00.9"; G= 17.28 mag) is located only 0.3" from this position, and the UV source GALEX J135327.5-672500 (position end figures 27.57s, 00.7"; NUV= 18.9 mag) is only 0.2" away. I will start observations from ROAD Chile the next night, weather permitting in BVI filters. Strong hydrogen emission line was detected in my low-resolution spectroscopic image taken with T17 0.43-m f/6.8 CDK astrograph + FLI PL4710 CCD at SSO, NSW, Australia. Photometry results were B=8.62, V=8.48, Rc=8.37 and Ic=8.22 with T17 0.43-m f/6.8 CDK astrograph + FLI PL4710 CCD at SSO, NSW, Australia. using AAVSO comp stars BMN 677 and 679. This object appears to be gradually brightening. I've been making DSLR obs. Was there an alert notice? Perhaps I missed it. I agree David, it seems to have risen noticeably since discovery. I took a low-res optical spectrum tonight and it seems virtually featureless. The nova was around 6.4 last night. Have you taken another spectrum since Jan 26 Rob? Yes, I took another low-res optical spectrum on 27.56 Jan UT and it was still showing no emissions. A high-res spectrum may show more. Incidentally, I used 30-sec exposures and they gave me a much stronger spectrum than the 150-sec exposures I used a week ago! It has brightened a lot. Visually I made it out at 6.6 on 27.46 Jan UT but tonight (28 Jan) I had clouds. But I did see it for a few seconds in a brief gap - not long enough to do an obs against the AAVSO comp stars but it seemed brighter against the adjacent star TYC 9243 2305 (V 5.7) than it did last night and it wouldn't surprise me if it was brighter than 6.4. Time will tell, looking forward to seeing what comes into the database. Went outside just after I posted the last message and there was a small break in the clouds. I made the nova out at 6.4 visually through 10x50 binoculars (28.63 Jan 2018 UT). Could not see N Mus 2018 because of cloud. Cool. Thanks. The light curve shows a plateau at 6.4 right now. We'll see what's in store for us. Still cloudy here tonight; and raining just now. AAVSO Alert Notice 613 announces and reports on Nova Cir 2018 = PNV J13532700-6725110. Please see the notice for details and observing instructions. ToO observations with the Fermi Gamma-Ray Telescope are underway and special optical coverage is needed in support. Many thanks and Good observing! This nova dropped almost a magnitude on 28/29 Jan, in 24 hours by visual observations in the database. It went from a level 6.4 to a level 7.3-7.4. However I observed, imaged and took a rough spectrum of it through variable cloud about 7 hrs before the reported drop to 7.3 (insufficient to do a proper obs) and it was still bright, similar to what it had been the night before. So the drop may have occurred in a period of just 7 hours. Last night (31 Jan 2018), during the total lunar eclipse, I took a low-res optical spectrum and saw emission lines (H-alpha, H-beta & FeII) for the first time since 20 Jan. The lines were clear but reasonably weak. Spectra I'd taken on 25, 27 & 29 Jan all showed no emissions and a fairly featureless continuum. This nova is worth watching closely if you're far enough south. I've been taking as many TB,G,R DSLR obs as possible. Not sure whether it will be clear tonight. I have a question about novae and the Fermi Gamma-ray Space Telescope: how often is Fermi pointed at novae and has this been happening for long? I see that N Mus 2018 has also been a recent target. More generally, I'm just curious to know more about the criteria applied to decide when Fermi or some other instrument is pointed at novae. The most important thing to note is that Fermi LAT (Large Area Telescope) is not a narrow field-of-view telescope - it's a wide field-of-view, all-sky survey mission. "With its very large field of view, the LAT sees about 20% of the sky at any given moment. In sky-survey mode, which is the primary observing mode, the LAT will cover the entire sky every three hours." (https://www.nasa.gov/content/goddard/fermi-spacecraft-and-instruments) In the sky-survey mode, the LAT will have more-or-less equal sensitivity to every part of the sky. When we "point" LAT at a nova, actually it still carries out an all-sky survey - just with an enhanced exposure time for the sky around the target, improving the sensitivity by about a factor of 2 (and hence sacrificing the sensitivity for objects in other parts of the sky). Since novae are transient gamma-ray sources, and even the bright ones are not that much above the daily or weekly detection limit of Fermi LAT, this factor of ~2 improvement in sensitivity really helps. Sometimes, a pointed observation of one nova also helps with the sensitivity for another nearby nova, like V5855 Sgr and V5856 Sgr in 2016 ("nearby" compared to the size of the LAT field-of-view). During the first 5 years of the Fermi mission, three novae (V407 Cyg, V1324 Sco, and V959 Mon) were detected in sky-survey mode. Pointed Fermi observations of novae started in 2013 with V339 Del. The early ones were requested by Dr. Teddy Cheung of Naval Research Laboratory, who is a member of the Fermi team. More recently, my colleague Prof Laura Chomiuk of Michigan State University and I have been the ones to make the request - and the Fermi mission team has been very accomodating (although I was turned down a couple of times last year due to other constraints). We tend to pick the optically bright, hopefully nearby novae for which we have the best chance of detection. Currently, we request pointed observations of any confirmed novae whose peak magnitude is brighter than about 10th. Hope this note was useful. Thank you very much for your considered explanation. It was useful! 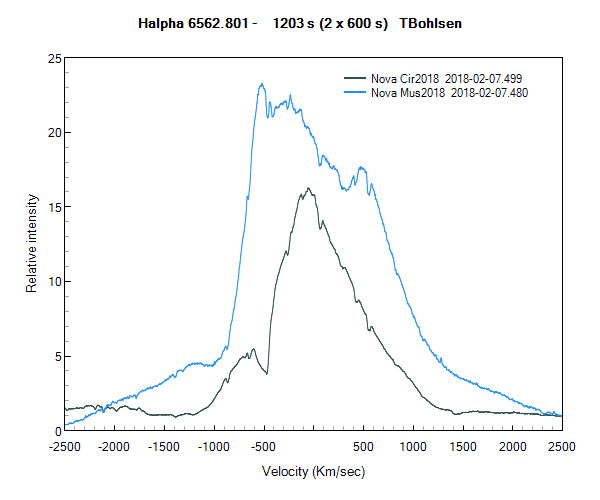 I took spectra of both Nova Cir 2018 and Nova Mus 2018 last night in the Ha region. They both have quite broad Ha emission but the expansion velocity of Nova Mus is much higher. Ity is interesting to compare them. Last night (17 Feb) I did a binocular visual obs of this nova which appears to be fading and my measure was way out of kilter with other obs received. I've checked the comp stars and found what partly but not fully explains the discrepancy - the 78 comp star has a very close companion only about a magnitude dimmer. Might be OK for narrow-field CCD photometry but they appear as one through binoculars so not suitable for use for that purpose. I'm happy to cop the remainder of the discrepancy but I'll remove the obs from the database in any case as it is obviously flawed. Promise to do better tonight if the clouds allow!! I noted too that comp star "74" (TYC 9244-00552-1) has VT = 7.56. You are correct, even when Vt is not V, for this blue star is the same. ASAS-3 has a small zero point error but we have Hipparcos data and in fact this star is constant at V= 7.56. Using the APASS value for such a bright star was not the best idea. Observers who used this comparison star might want to re-reduce their data. This nova continues to surprise. Currently it’s brighter than 6th magnitude and has risen steeply over the last few days. After peaking around V= 5.8, the star dropped two magnitudes in three days. Around 8th magnitude there were problems with the sequence: the 78 comp star was actually a 24" double with a 9th mag. companion and a combined brightness of 7.5 so it was dropped from the sequence. 74 and 79 comp stars were added so please update your charts. The chart for PNV J13532700-6725110 in aavso variable star plotter is inviting for a chart of Nova Carinae. Explaining better: when I put PNV J13532700-6725110 or Nova Circini 2018 in the VSP , the program generates a chart for Nova Carinae 2018. Clear the cache and check the different fields. E.g. : You may be using a chart code corresponding to a Nova Car 2018 chart. Let us know if that solved the problem. Not solved. I cleared the cache of the browser and the problem continues. VSP generates a chart for Nova Carinae if I put PNV J13532700-6725110 or Nova Circini 2018 in the first field. Its only with me? I enter Nova Car 2018 and Nova Cir 2018 and get correct charts for each. Well, this is strange and probably is due to my browser. I will try to fix it. Thanks. Have you got anything written in the space "Chart ID"? That may be the problem. Or have you got anything written alongside "What will be the title for this chart?" Best wishes in resolving your problem. I tried to get the chart using another computer and this time I got the corret one, so I believe that the problem was in the cache of of the browser. Thanks for the attention.